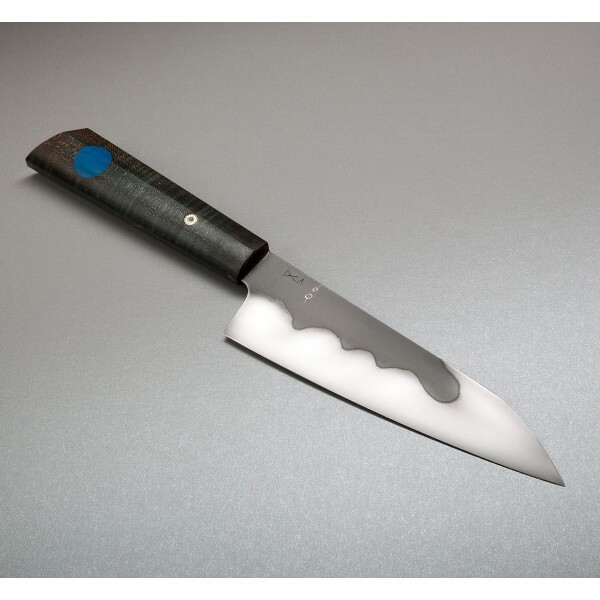 Dressed up and ready for action, this 6.75" (175mm) stick-tang Personal Chef features dyed and stabilized curly maple with a rare Westinghouse blue ivorite inlay and a large mosaic pin. The 1095 carbon steel blade has been differentially heat treated using clay and is polished and etched to reveal a beautiful hamon. Don's unique designs combine elements and styles from multiple disciplines to create a look and feel all his own. 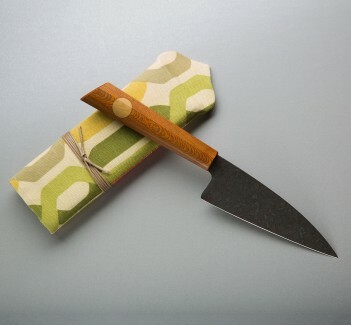 The stick-tang-construction, stock-reduction carbon steel blade measures in at a length substantial enough for any job, including knuckle clearance for serious chopping, while being just small enough to fit into a tight corner and handle the finer tasks at the same time. This piece includes a cloth-wrapped protective case. 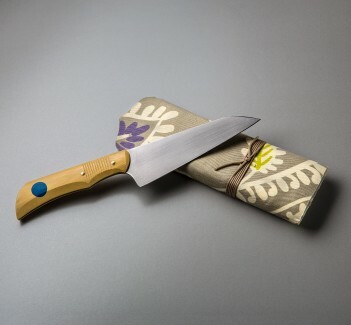 Don Carlos Andrade's work is not only unique and unmistakable in design and aesthetic; with his background in professional kitchens, each knife is also finely tuned to be a workhorse in the kitchen. 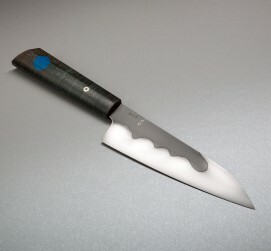 Don employs a variety of techniques and finishes to give each knife its own personality: from stock reduction to forging, from stick tang to full tang, from hand-rubbed blades to finishes with beautiful hamons like the one seen here.